"The bolts are well lubricated, the athletic robots league is going start. But are our champions well enough trained to win ?" Robot and Basketball, two decorating themes in one ! Can we dream for a better kids room decor, for boy’s bedroom in particular ? 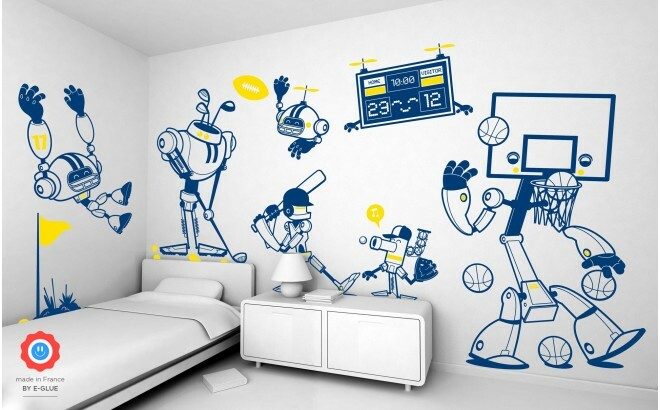 E-Glue has designed these basketball players, through a funny mix of robots and sportsmen, and turn them into giant wall decals to decorate the children’s bedrooms, nurseries or playrooms. Up to you for a decorative dribble ! For example, see below a wall decal Hitter Robot (dark blue and light yellow) applied on a light grey wall.